The opening theme song, “Face My Fears,” from eight-time Grammy Award winner and long-time self-professed fan of the KINGDOM HEARTS series, Skrillex, and internationally-renowned singer-songwriter Hikaru Utada, is available on the iTunes Store: https://itunes.apple.com/us/album/face-my-fears-ep/1444855032?app=itunes. 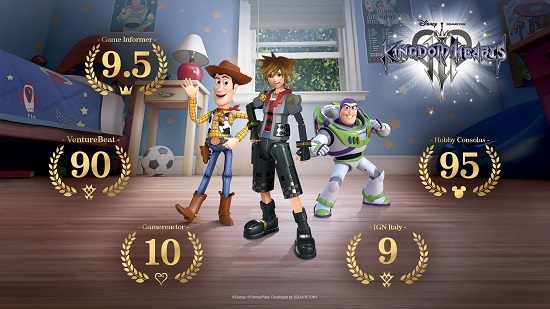 KINGDOM HEARTS III is now available for $59.99 on the PlayStation®4 computer entertainment system and the Xbox One family of devices including the Xbox One X. This title is rated E10+ (Everyone 10+). Please visit the Entertainment Software Rating Board (ESRB) website at www.esrb.orgfor more information about ratings. NAIRI: Tower of Shirin - Switch & Steam Codes Available!